Provided by Rachel McDonald White pine trees in the Great Lakes Marsh at the Ojibwa Recreation Area inside the Keweenaw Bay Indian Community reservation. 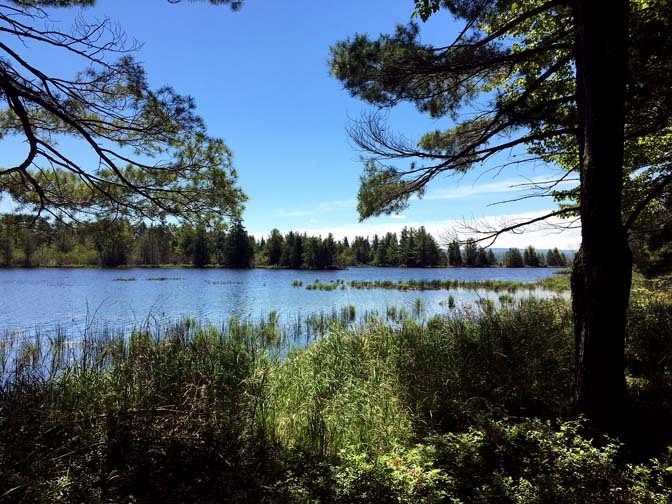 BARAGA — A new draft of a forest stewardship plan for the Keweenaw Bay Indian Community (KBIC) has been posted for public comment and is available on the KBIC homepage and at the Tribal Center. The plan is a necessary update to the last plan from 1997, according to KBIC Forester Rachel McDonald, who prepared the draft. “The last version had lots of information about the timber resource in KBIC forests but not about other resources,” McDonald said. For the new draft, surveys of tribal members and input from sessions with other KBIC departments were collected. This helped McDonald create a plan that addresses additional uses of the forest like hunting, gathering, recreation, sugarbush, firewood collection and wildlife habitat. The draft plan also addresses the implications of climate change and strategies for resilience. Provided by Rachel McDonald The new KBIC stewardship plan covers forests and drainage conditions within the Keweenaw Bay Indian Community reservation. “KBIC has the opportunity to be proactive in some cases and plan projects to help forests be more resilient,” McDonald said. These projects, often completed by hired members of the tribe, include habitat improvements through planting, the release of crop trees for harvesting, and underplanting for emerald ash borer mitigation. The plan also contains provisions for how cultural knowledge can be shared through conservation education opportunities. “KBIC has a holistic approach to forest stewardship, and promotes the ecological health of its forests for the next seven generations,” McDonald said. The plan is qualified as a Natural Resources Conservation Service Forest Management Plan and U.S. Forest Service Forest Stewardship Plan, as well as meeting requirements of the Tree Farm Association. It will be considered current for a 10-year period. The public comment period for tribal members ends on Dec. 17. Comments can be sent to McDonald at rmcdonald@kbic-nsn.gov and will be compiled and forwarded to the Tribal Council with the draft. Graphic from Michigan.gov This map marks service areas for different electrical utilities in the Upper Peninsula. UMERC is marked in green and UPPCO in blue.